The Babcock & Wilcox Company (B&W) (NYSE:BWC) announced today that its subsidiary Babcock & Wilcox Canada Ltd. The Babcock & Wilcox Company (B&W) (NYSE:BWC) announced today that its subsidiary Babcock & Wilcox Canada Ltd. (B&W Canada) has been awarded a long-term master services agreement that establishes a framework to provide its customer, Bruce Power, with nuclear services and components for its commercial nuclear operations in Tiverton, Ontario. As part of this award, B&W Canada will supply outage services for steam generators and preheaters at all Bruce Power units for the next six-year term. The nature of the work includes engineering, tooling development, skilled trades training and site work execution. The contract anticipates a value of approximately $300 million and represents more than 100 jobs in a variety of disciplines. Bruce Power operates the world's largest operating nuclear generating facility and is the source of roughly 30 per cent of Ontario's electricity. The company's site in Tiverton, Ontario is home to eight CANDU reactors, each one capable of generating enough low-cost, reliable, safe and clean electricity to meet the annual needs of a city the size of Hamilton. 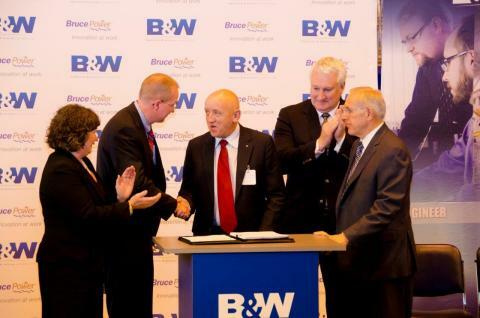 "We're a proud, long-term supplier to Bruce Power, dating back to 1977 when we supplied the site's first nuclear steam generators," said President, B&W Canada, John MacQuarrie. "This award represents our continued commitment to supplying Bruce Power with trusted solutions that support the production of safe, clean, affordable power for Ontario." B&W Canada and Bruce Power participated in an official signing ceremony on November 27, which was attended by Ontario Minister of Energy, Honorable Bob Chiarelli, Member of Provincial Parliament for Cambridge, Kathryn McGarry, community leaders and staff. Work associated with the award of this contract will commence in January 2015. It is expected to carry out into 2020 and provides a foundation to be expanded as Bruce Power proceeds with extending the lives of its Units as outlined in Ontario's Long Term Energy Plan. Headquartered in Charlotte, N.C., The Babcock & Wilcox Company is a leader in clean energy technology and services, primarily for the nuclear, fossil and renewable power markets, as well as a premier advanced technology and mission critical defense contractor. B&W has locations worldwide and employs approximately 11,600 people, in addition to joint venture employees throughout the world. Follow us on Twitter @BabcockWilcox and learn more at www.babcock.com . B&W cautions that this release contains forward-looking statements, including statements relating to the value range, performance and timing, to the extent either can be viewed as an indicator of future revenues, of the master services contract with Bruce Power. These forward-looking statements involve a number of risks and uncertainties, including, among other things, the amount and scope of work that B&W Canada is engaged to perform under the contract, delays or other difficulties in contract execution, or modification or termination of the contract. If one or more of these or other risks materialize, actual results may vary materially from those expressed. For a more complete discussion of these and other risk factors, please see B&W's annual report on Form 10-K for the year ended December 31, 2013 and subsequent quarterly reports on Form 10-Q filed with the Securities and Exchange Commission. B&W cautions not to place undue reliance on these forward-looking statements, which speak only as of the date of this release, and undertakes no obligation to update or revise any forward-looking statement, except to the extent required by applicable law.